When you go to Montreal for the very first time you walk to Schwartz’s Deli and have their smoked meat sandwich. End of discussion. 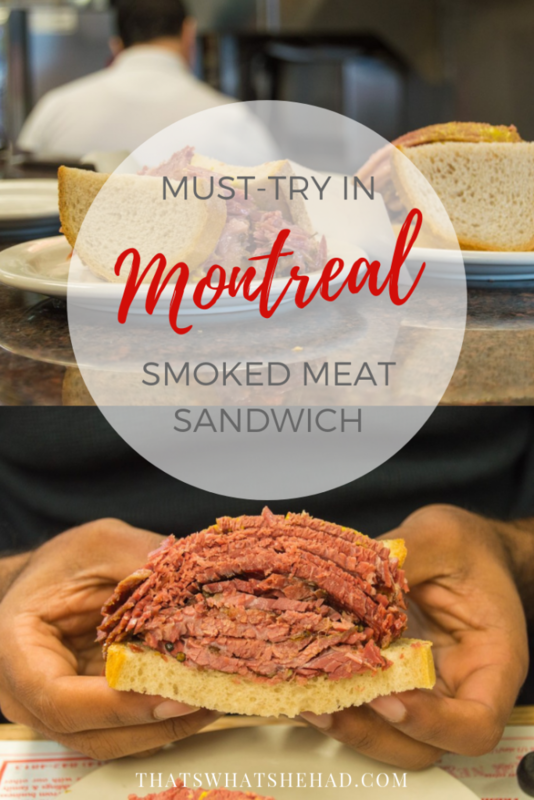 Some people say: “Oh, this place is so touristic”, “They have nothing to offer but their fame”, or “There are places that make smoked meat sandwich better”. I say: go there, try it, and decide for yourself. 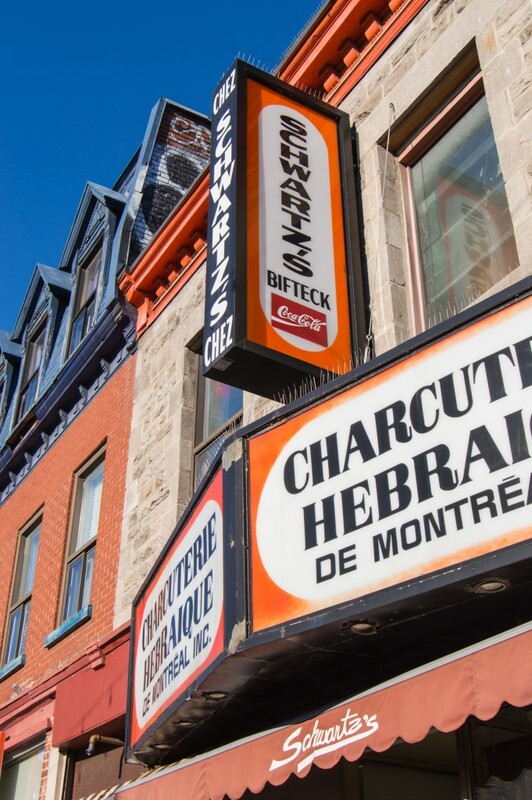 One of Montreal’s iconic restaurants, running since 1928 and selling 20 000 lb of smoked meat weekly, is definitely worth a visit. Besides, if Anthony Bourdain says: “You can’t not do this when you come to Montreal”, then you go and do it. 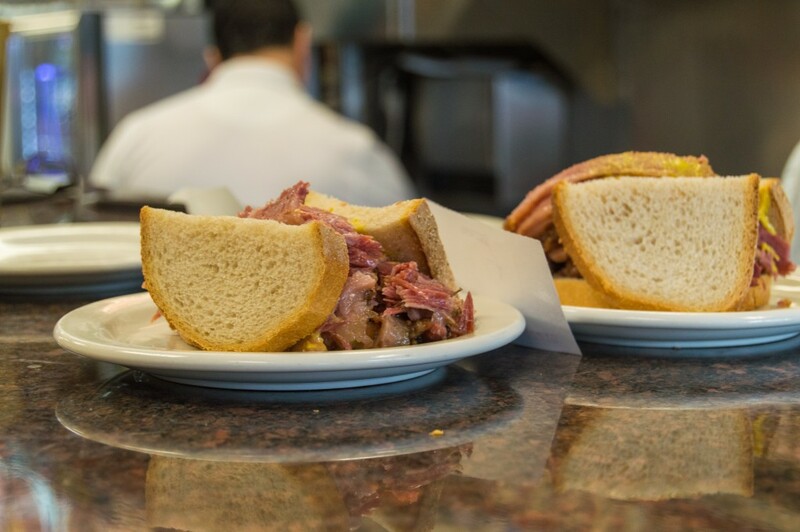 Is Schwartz’s smoked meat sandwich the best in the city? I wouldn’t be able to say since it’s the only one I’ve tried. But I can vouch it’s a simple, straight forward, and honestly good sandwich. 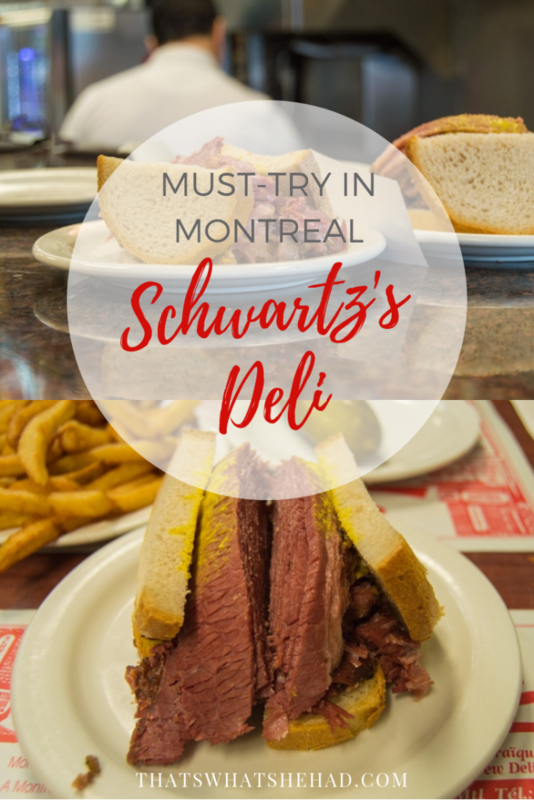 When I walked inside Montreal’s Schwartz’s Deli I couldn’t help but compare it to iconic Katz’s Deli in New York. Newspapers and pictures of celebrities pasted on the walls; a long counter on the right, tables on the left; and people, who have nothing in common but desire to try the legendary sandwich, sharing one table. My husband and I made our way through the narrow pass between tables and the counter and sat down next to a group of teenagers. They, too, were comparing Schwartz’s Deli to Katz’s. 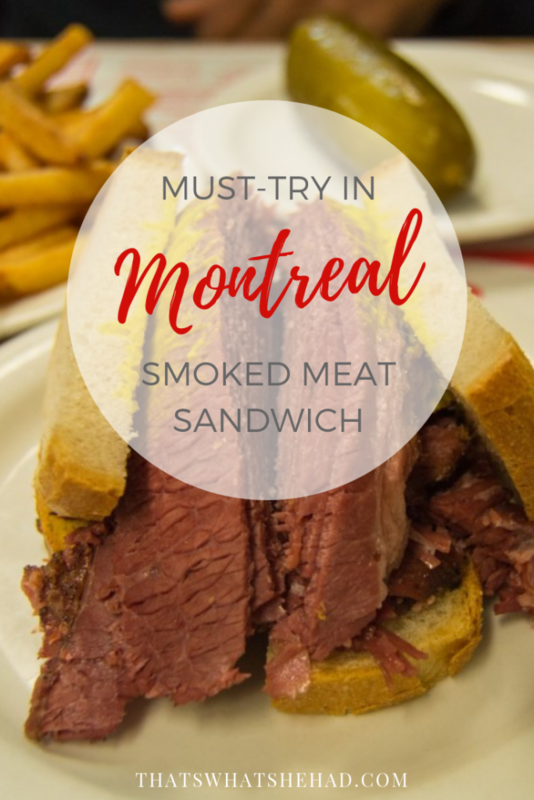 Katz’s pastrami sandwich is a must-try in New York, Schwartz’s smoked meat sandwich is a must-try in Montreal. These two have more similarities than differences, to my mind, but I wouldn’t dare bring it up when inside either one of the delis. 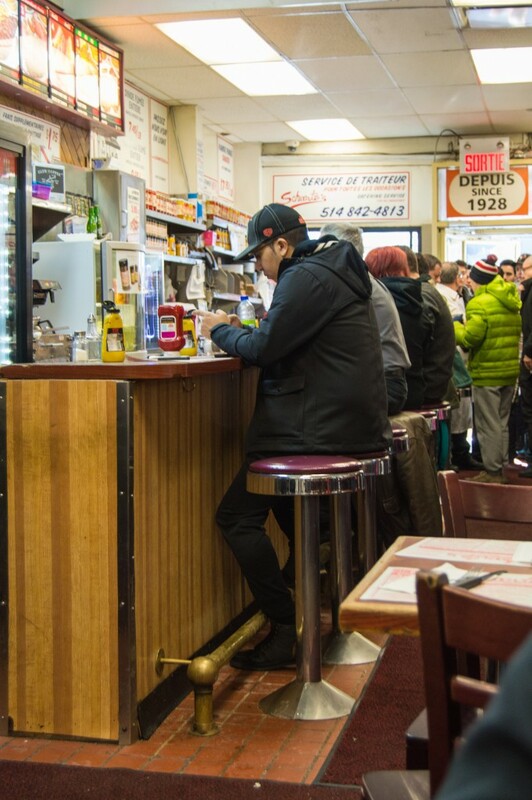 Schwartz’s Deli is much smaller and, therefore, cozier. Point to Schwartz’s. But with the popularity of this place less tables means longer line of people in front of the deli. Point to Katz’s. Munching on French fries and pickles while waiting for the sandwich to arrive. Same branded paper placemats on the tables. Pickles here are not a free appetizer like at Katz’s (point to Katz’s), but they are available and they are very good (point to Schwartz’s). 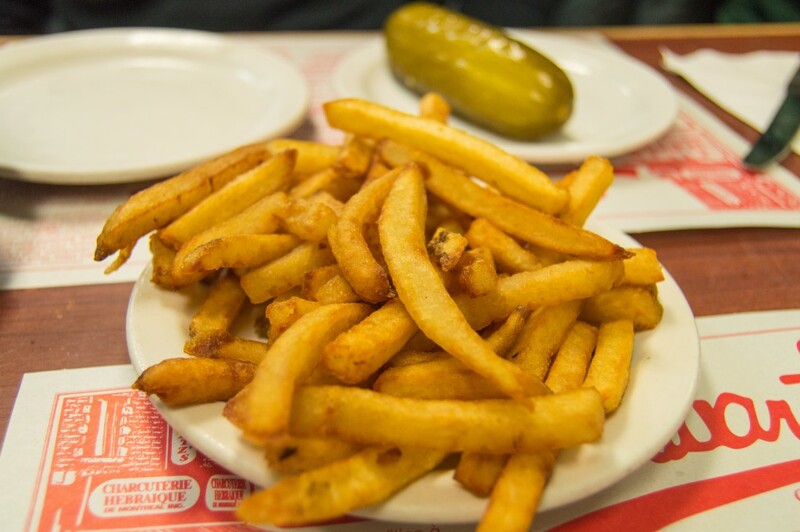 We munch on pickles and french fries while waiting for sandwich to arrive. 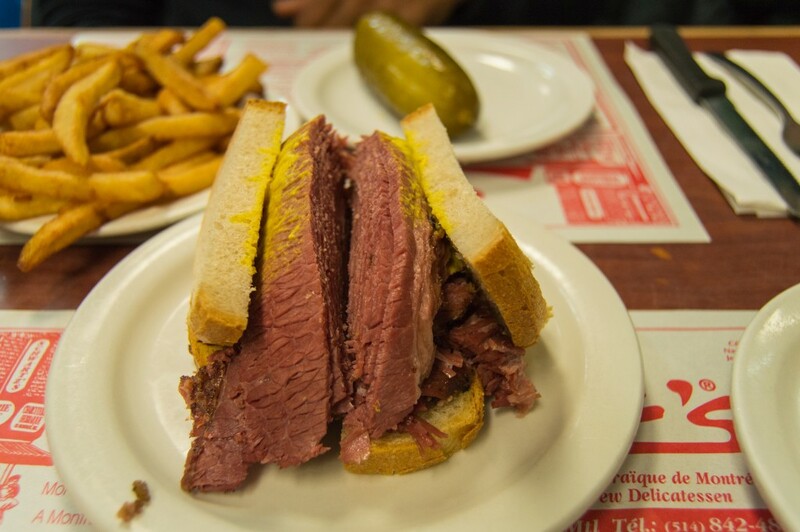 When ordering a sandwich you can choose whether to have your smoked meat fatty or lean. Here’s where the differences begin. The first difference and, probably, the most important one, is the cut of meat. Pastrami is generally made of navel part of beef, while smoked meat is made of brisket. So when a waiter in Canadian deli comes and asks you whether you want your meat fatty or lean, it means depending on your choice, you’ll receive a sandwich with varying amounts of meat from each portion of the whole brisket. When the sandwich finally arrived, it was a beauty to look at with brisket falling apart and bread not being able to support the mountain of smoked meat. It is always served on rye and with mustard so yellow it looks like a can of paint was spilled on bread. 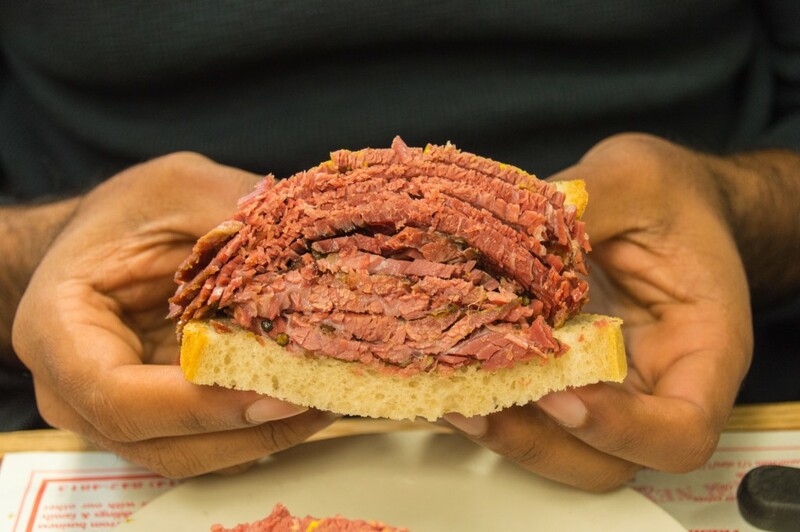 Experienced by our visit to Katz’s we ordered one sandwich to share. Katz’s pastrami sandwich was definitely a challenge to eat all on your own. Schwartz’s sandwich is quite smaller and makes a perfect meal for one person. So after finishing up the first one, we ordered one more right way. I am not sure to whom the point goes here. On the one hand, more food is always great, on the other hand, I prefer to feel full but not stuffed at the end of the meal. So point to Katz’s for making a shareable delicacy and point to Schwartz’s for perfectly sized portions. I am not greedy: you get a point, you get a point, and you get a point! In the end, who cares about points? All I care about is a delicious and satisfying sandwich and Schwartz’s definitely got it. On a winter day in Montreal a dream of this sandwich for lunch got me through climbing Mount Royal in the morning and the sandwich itself fueled me up to walk all the way to Jean-Talon market afterwards. Tip: bring some cash, they don’t accept credit cards.